card jitsu | Fosters1537 and Yellow Crown's Club Penguin Guide! Club Penguin Card Jitsu Shadow: Sneak Peek Power Card Spotted ! Card Jitsu Snow has finally launched two weeks ago together with new Dojo updates but there are still Card Jitsu rumors that haven’t come true yet. That’s right, I’m talking about Card Jitsu Shadow. Though Card Jitsu Shadow was never confirmed, shadow-related ninja items have been in Club Penguin’s SWF database for a while. Yet they have never been released yet. Finally after the release of Card Jitsu Snow, penguins spotted new power cards which relate to the rumored Card Jitsu Shadow items. 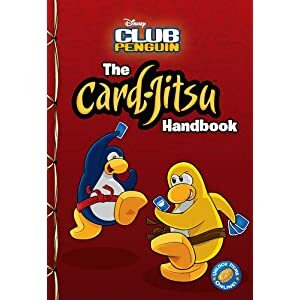 Anyone can get these power cards by buying a set of Power Cards on the Martial Arts catalog, but you must be lucky to get one of the Card Jitsu Shadow power cards. So what do you think? Do you think Card Jitsu Shadow is real? If so, when do you think it’s coming? November 2011 Parent Update.. iwht a tiny leak! Penguins, check your emails! Club Penguin teams sent yet another month’s Parent Update email with some old news but a new leak..
Card Jitsu Party coming in November 24, the island will be transformed into a huge dojo with new places to play Card Jitsu. Also if Fire and Water ninjas unite they may control the weather. I guess this means if you wear an element suit and dance then doing a special dance with other penguins you might create a Fire Storm or Rainfall there and than! Sweet! 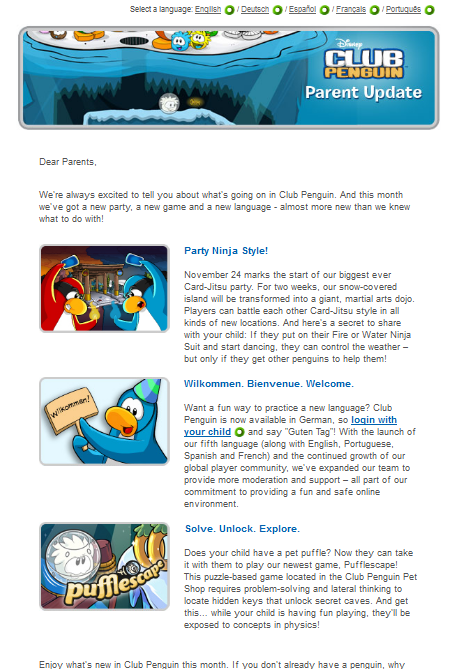 Club Penguin now also in German, the game’s fifth translated language. Pufflescape now available at the Pet Shop which might also help your child test some physics! Hah! If only Physics was that cool and easy with Pufflescape! 🙂 Anyway, I think the new stuff here is the ‘BIG surprise’ Billybob mentioned to those who earned their Fire and Water suits that when more than about 5 penguins unite by doing a special dance using the suit you might be able to control the weather with a rainfall or a fire storm … all starting November 24! Liam on New Puffle Hair Items, Unlocking Items and Puffle Launch apps!! Yet another video blog, though it has been some time since the last one. Anyway, Liam is back to talk about new stuff: the rumored uncheckable Puffle Hats will be here soon and a good news that Puffle Launch will ‘launch off’ new bonus levels plus a FREE LITE version! Sa-weet! What are you looking forward most? I’m excited to update my Puffle Launch app on my Android phone to check out the new bonus levels! Card Jitsu Party Sneak Peek! Billybob posted a Sneak Peek on the English What’s New! blog but it seems to have been taken away but you can read it on the French blog! As far we released a new set of ninja each year, many of you ask when you will release Snow Card-Jitsu. Preparing a new Card-Jitsu gigantic party. For the first time, we’ll decorate the whole island ninja way! There will be new decorations, new objects, new stamps, new rooms and available only at the party! 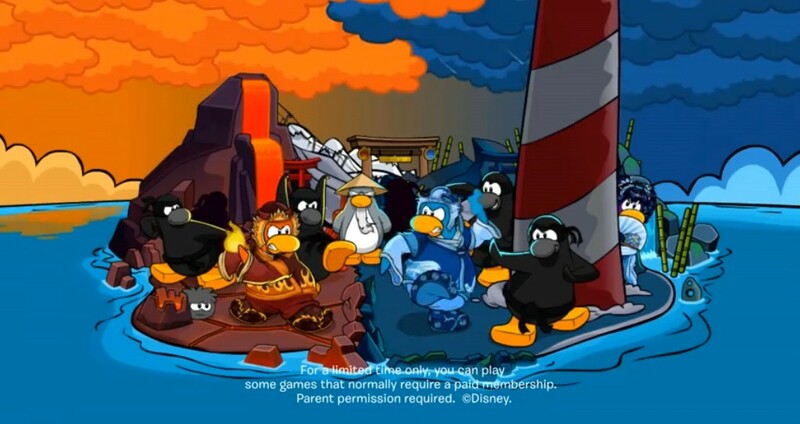 For the first time, the penguins who have free accounts will be able to play Card-Jitsu Fire and Water at the party! It was also a big surprise for those who manage to win their Elements of Fire and Water. As always, tell us what you think by sending us a comment. We love your advice! Great! The Plaza looks amazing. Notice that there will be MORE than ONE free item! Also in the picture, the Stage says ‘Ancient Shadows’ that would be the (or part of) the name of the new play at the Stage! Also Card Jitsu Party is the first party to be new and island-wide for 2011, and maybe the largest party for Club Penguin’s Novembers. What’s New November 2011 Membership Update! Enter the mysterious Ninja Headquarters. Earn your reward. Discover the ancient dragon at the Stage. Uncover your inner sushi master with this month’s Penguins at Work. 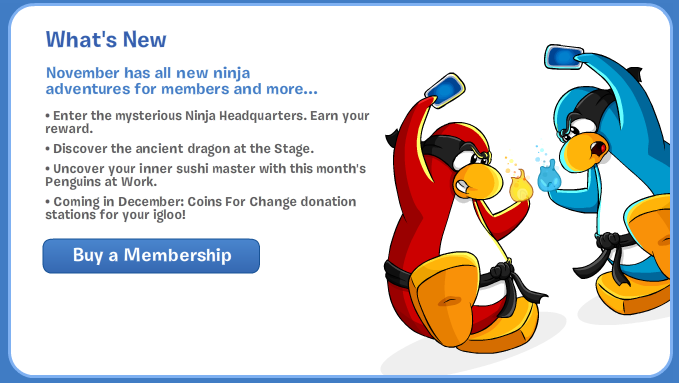 Coming in December: Coins For Change donation stations for your igloo! Looks like it will be likely to be a Card Jitsu Party, with a ninja clothing catalog this November. But no mention of Card Jitsu Snow yet? At leats it seems there WILL be another new play at the Stage (finally news plays!) Coins For CHange will return this Christmas too. What do you think? What are you looking forward for most? It’s official, there has been lots of rumors including the apps being mentioned in a Portuguese magazine that a Puffle Launch app and Card Jitsu app will be out and Billybob announces the Club Penguin apps ARE coming out soon! Over the past few months, we’ve heard some rumors, and many of you have asked if we’re making a mobile app… Guess what? 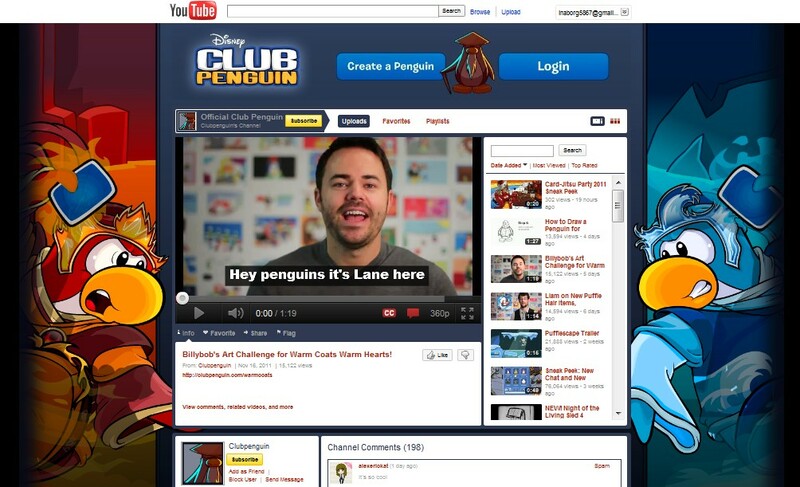 We’re excited to announce that we’re just about finished our very FIRST Club Penguin app! We can’t say too much just yet, but we’ll have more info for you in the next few weeks. So what do you think our first app will be? Let us know your best guess in the comments below! Notice that it looks like it’s not a mobile app where you play Club Penguin online but there will be a number of Club Penguin apps to play different games. Will they be for free? We don’t know. Will the apps be for Android too? We don’t know but we hope so. We don’t even know the name of the first app either so stay tuned as more news about these apps will be shared here!